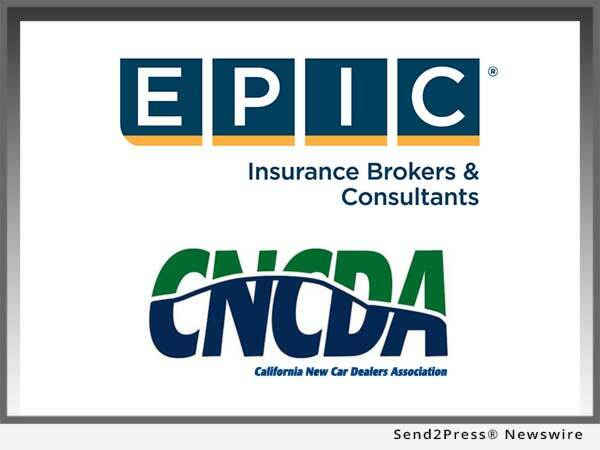 EPIC Insurance Brokers and Consultants, a retail property, casualty insurance brokerage and employee benefits consultant, and the California New Car Dealers Association (CNCDA) jointly announced today that CNCDA has expanded their relationship with EPIC, appointing the insurance broker / consultant as their exclusive licensed broker to provide health and welfare insurance consulting to CNCDA members across the state. SACRAMENTO, Calif. /Mortgage and Finance News/ — EPIC Insurance Brokers and Consultants, a retail property, casualty insurance brokerage and employee benefits consultant, and the California New Car Dealers Association (CNCDA) jointly announced today that CNCDA has expanded their relationship with EPIC, appointing the insurance broker/consultant as their exclusive licensed broker to provide health and welfare insurance consulting to CNCDA members across the state. EPIC was previously the CNCDA appointed health and welfare insurance broker/consultant in Northern California only, and this new agreement extends their reach and responsibilities to CNCDA members across Southern California, as well. The California New Car Dealers Association is the country’s largest state association of franchised new car and truck dealers representing over 1,100 dealer members. CNCDA members are primarily engaged in the retail sale and lease of new vehicles, and also engage in automotive service, repair and part sales. CNCDA promotes fair and ethical business practices through a wide range of educational programs, services and industry publications. Learn more about CNCDA at: http://www.cncda.org/. With run rate revenues approaching $300 million, EPIC ranks among the top 20 retail insurance brokers in the United States. Backed by the Carlyle Group, the company continues to expand organically and through strategic acquisitions across the country. For additional information, please visit: http://www.epicbrokers.com/.